2018 Silver Eagle Roll - 20 Gem BU American Silver Eagles - Free US Shipping! 2018 Silver Eagle Rolls - IN STOCK! 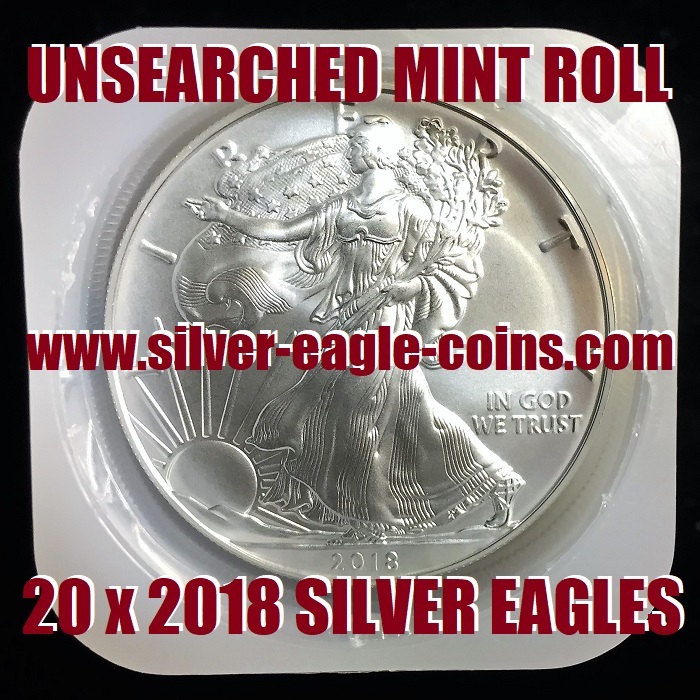 The Silver Eagle Coin Company is pleased to offer mint fresh 2018 Silver Eagle Rolls. Each roll contains (20) GEM Brilliant Uncirculated coins, each coin contains one ounce of 0.999 pure silver. These rolls come directly from a mint-sealed green monster box (500 coins) and have not been searched or "cherry-picked" for perfect coins. We do not "slab" silver eagles and sell off the rejects like many other dealers. We simply take a mint roll from a newly opened green monster box, tape the lid shut for safe travel, and ship it to you. (NOTE: The U.S. Mint recently changed the silver eagle tubes by making them slightly taller so the green top fits better. However, to prevent the coins from "rattling together" during shipping, we insert a piece of foam inside the mint tube before sealing the top securely with tape. Contrary to popular belief, rolls are never "mint sealed" like some dealers advertise. Ours are "dealer sealed" for maximum protection during shipping.) Minor flaws or blemishes are possible. Perfect coins are also possible. The coins are exactly as we receive from the U.S. Mint with no returns permitted. Since many customers ask us about graded silver eagles and why we don't offer them, our reasoning can be found here. NOTE: For security reasons, we can only ship silver eagle rolls to a "Confirmed Address" (same as your CC billing address). Orders which request shipping to an unconfirmed address will be canceled/refunded. 2018 Silver Eagle Rolls are available at $390.00 per roll (Insured U.S. shipping included). To order, please click the button below. NOTE: The free shipping offer only applies if shipping to a U.S. address. Please e-mail for International Shipping Rates. NOTE: Coins may sell out without notice and prices are subject to change without notice. Once you order, your price is locked in -- regardless of whether silver goes up or down in value subsequently. Orders cannot be canceled or modified in any way once placed. IMPORTANT NOTE: Due to the unstable silver market, please "refresh" or "reload" this page on your browser or mobile device to see current pricing. We are unable to honor any orders received from obsolete or "cached" web pages that are days or weeks old. Such orders will be canceled/refunded. Copyright © 2018, Silver Eagle Coin Company. All rights reserved.